Jon Favreau's delightful live action The Jungle Book, adapted from the beloved Disney cartoon which was adapted from the beloved (?) tale by Rudyard Kipling, is like a really weird episode of Naked and Afraid with a bunch of talking CGI animals. To be fair, Mowgli (a charming Neel Sethi), the young "man cub" found by a talking panther named Bagheera (voiced by Sir Ben Kingsley) and raised by wolves (voiced by Lupita Nyong'o and Giancarlo Esposito), is rarely afraid. Mowgli is a bright, cheerful boy, growing up in the jungle and doing the best he can to be a good wolf to his pack, while at best tolerated by all the other beasts. Except for one beast who finds him simply intolerable, the savage tiger Shere Khan (voiced by Idris Elba, from, appropriately, Beasts of No Nation). Shere Khan killed Mowgli's father years ago for the crime of intruding upon the jungle, but was scarred by the "red flower," the one weapon Man possesses that all in the jungle most fear -- fire. As such, Shere Khan wants Mowgli dead, and, being a tiger, he doesn't really have much else to occupy his time besides hunt the man cub and give him a good mauling. Mowgli is forced to abandon the wolf pack and make a run for it. (Which really doesn't say much about the wolves -- a whole pack of them can't take down one tiger? No, we find out in the climactic battle, turns out they can't. Those are some wussy wolves.) Bagheera attempts to return Mowgli to his own people, but Shere Khan hunting them makes that impossible. They are separated, and Mowgli has the misfortune to be robbed of his scavenged fruit by a pack of wild monkeys, hypnotized and nearly eaten by a giant snake (voiced by Scarlett Johansson), who somehow knew Mowgli's entire origin story, but Mowgli also has the good fortune to meet his new bestest bear buddy Baloo (voiced by Bill Murray). 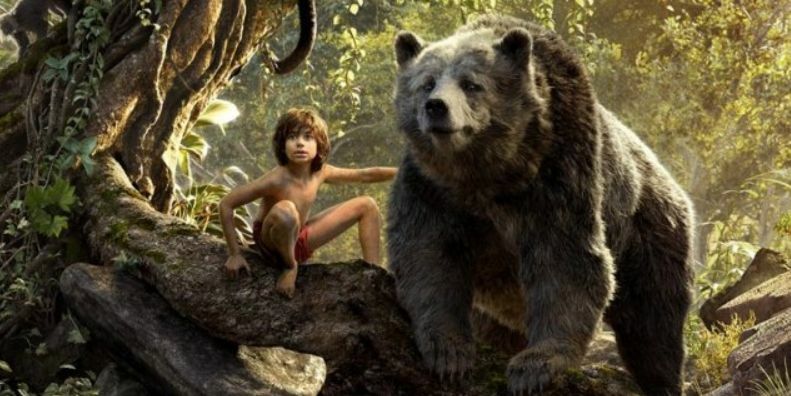 After what happened to Leonardo DiCaprio in The Revenant, Leo must have been pissed seeing The Jungle Book's bear being so nice to that friggin' kid. The Revenant's bear never let Leo float on his stomach down a river while singing "Bear Necessities" to him. Then again, Leo was never tricked by his bear to climb up a cliff and risk getting stung by bees to bring down honeycombs. Still, Mowgli had it way better than Leo. Mowgli can't help but be a do-gooder, though. Like Macauley Culkin in Home Alone, young Mowgli possesses inherent skills in building and using human tools, and he has a profound understanding of pulleys and winches most civilized adults don't even have. Mowgli does a bunch of elephants a solid when he uses his skills to rescue one of their cubs from a pit, and it turns out no good deed by Mowgli goes unrewarded when the elephants later use their abilities at jungle terraforming to save the jungle from being burned down by the fire Mowgli accidentally started (oops). Besides the evil tiger who wants him dead, monkeys are the bane of Mowgli's jungle life, as he is soon kidnapped by monkeys and brought before a giant ape named King Louie who lives in "a giant monkey temple" and wants that red flower (voiced by a distracting Christopher Walken, to be honest, who also sings). One waits for Walken to tell Mowgli a story about his father and a gold watch, to no avail. Also, considering how far Mowgli traveled, apparently, one night of running through the jungle can bring him right back to where he started from for his fateful final battle with Shere Khan. In the end, The Jungle Book is a winning and enjoyable tale of a man cub becoming one with nature, after killing the things in nature that want to kill him, and nearly burning down that nature by being careless. But hey, man cubs will be man cubs.